With the economic downturn continuing, parents in Russia are struggling to make ends meet, with rising costs of school-going children and real incomes declining. With children heading back to school after summer holidays, Russia’s continued economic slowdown and decline in real income levels is forcing some parents to make difficult decisions about educational expenses. Victoria, a single mother of a 13-year-old son, used to make enough money to live comfortably in Moscow and also take an out-of-town annual vacation. However, with the fall in the value of the ruble, her monthly salary now is the equivalent of $920 a month. 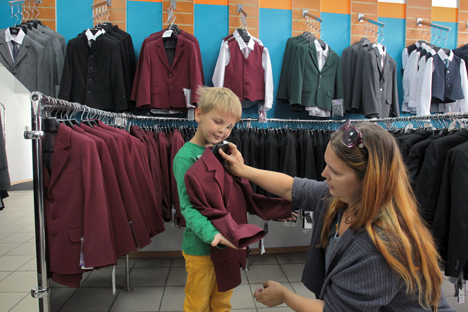 She has spent 20,000 rubles ($300) this year on her son’s back-to-school expenses. Most Russian schools require uniforms to be worn. These can cost between 2,500 and 6,000 rubles ($38-$92). Students must have separate uniforms for P.E., shoes to wear inside the school building (school children must leave shoes worn outside in the cloakroom) and pens, notebooks and workbooks. Additional school expenses have forced Victoria to cut back on the kinds of food she buys. “Sometimes, I even deny my son his favourite grapes. Earlier, I bought them all the time, just like cucumbers and peppers, but they have become much more expensive,” said Victoria, adding that she has started to put more of her food purchases on her credit card. The cost of school supplies, parents estimate, has risen on average by 15 percent compared to last year. Meanwhile, the real wages of Russians has declined by 9.3 percent in the first half of 2015, according to figures from the Russian State Statistics Service, Rosstat. According to the news agency TASS, parents living in the Central Federal District, which includes Moscow and the surrounding regions, will spend the most on back-to-school purchases; between 25,000 and 27,000 rubles ($380-$414) on average. In the Volga Federal District, which includes Russia’s third-largest city, Nizhny Novgorod, prices are lower. In Nizhny Novgorod, parents spend 10,000 rubles ($153) on average. The average salary in the region is also lower, however, around 27,000 rubles. Costs are also high in Russia’s Far East. In the Khabarovsk Territory, for example, parents will spend 20,000-25,000 rubles, out of an average salary of 36,500 rubles ($560). Costs just go up for parents with several children, even if not all of them are in school. Last year, Muscovites Irina and Pavel had a third child. Although only their oldest son goes to school, education-related expenses take a major chunk from their income, which is about 40,000 rubles ($670) per month. And the situation is even more difficult for needy families — the number of which has increased significantly with the financial crisis. The number of Russians living below the poverty level (9,700 rubles or $150) has reached 22 million, Deputy Prime Minister Olga Golodets told the Interfax news agency in July. Regional authorities are trying to help the poorest citizens to prepare children for school with lump-sum payments at the beginning of the school year; the amount varies depending on the region. Volunteers also help poor families and families with several children get their kids ready for school. In the town of Smolensk in western Russia, a local priest put a notice on online forums asking for people to contribute money to help needy families or donate school supplies. “People donate less than last year, but still continue to help – both retired women and even school students bring donations,” said Natalia Popova, the officer-in-charge of the church’s social service and charity department.